Choose from the traditional snorkel and mask which is suitable for skin diving (also known as duck diving) and requires you to breath only through your mouth. 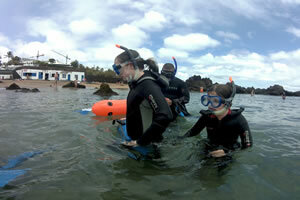 This could be the perfect introduction to scuba diving and you may choose to go on to do a scuba try dive experience. Alternatively, you can choose to snorkel with the NEW full-face mask & snorkel. Designed to be used on the surface only you can breathe easily and normally through this all in one combined mask and snorkel. This is ideal for those that feel uncomfortable with the traditional style of mask. Easily adjustable and with great visibility these are a must try for any one. We have full-face masks, and masks & snorkels in stock to buy, as well as a large selection of masks and snorkels, in a variety of different colours and styles to fit all different sizes and face shapes. Yes, you need to be comfortable in the sea and able to swim at least 100 meters. Is there a minimum age and maximum age? You need to be a minimum of 8 years old; there is no upper age limit. Children aged 8-12 years old, must be accompanied by a parent or other responsible adult. You don't need to be super fit however you will be physically exerting yourself so you do need to be generally physically fit and in good health. We suggest that you are capable of walking 1.6km or 1 mile in 12 minutes. There are conditions that will preclude you from participating, such as a history of respiratory conditions and heart disease or having a cold or conjestion. Swimwear, towel, sun protection, footwear - we provide the rest! The whole experience will be about 2 hours and you will be in the water for 30-40 minutes. When are the snorkel tours? In the afternoon, starting at the dive centre at 14:30. How much is a snorkel tour? 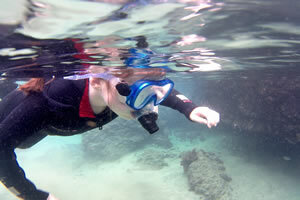 A snorkel tour is only €25,00 per person. Group discounts available for groups of more than 4 people.